Today I was literally outside from sun up to just before sundown. Today was Presidents’ Day in the U.S. and for some reason, my agency had it off for the second year in a row. (Hey, I’m not complaining. There aren’t nearly enough mandatory holidays in this country and I’ll take whatever I can get). 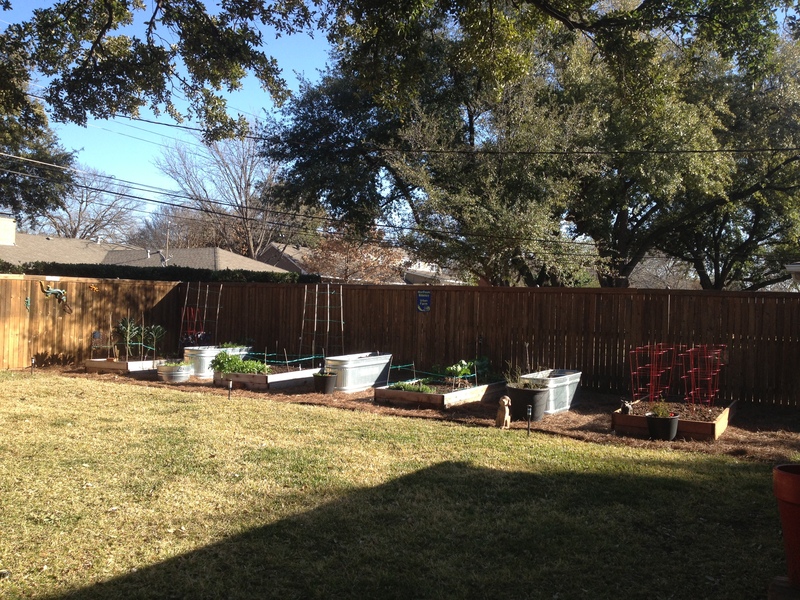 I’ve been planning today in my head for weeks: Phase 1 of the 2013 spring garden. 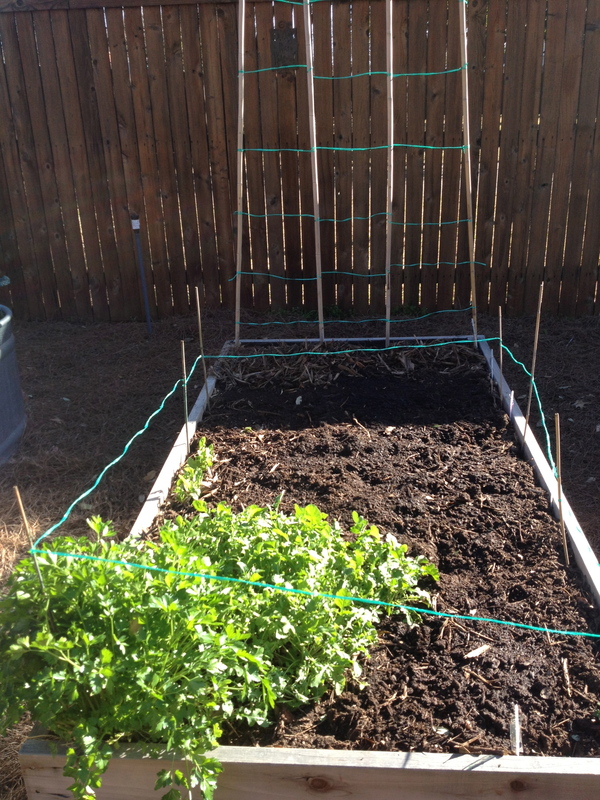 It’s Phase 1 since there are still many winter crops that are not all done and there are still transplants that need to come in — like tomatoes and peppers. One caveat: like most of my “project” plans, I did not plan that it would take as long as it did. At least it was a beautiful sunny day, slightly breezy and I had no real plans for later on in the evening. 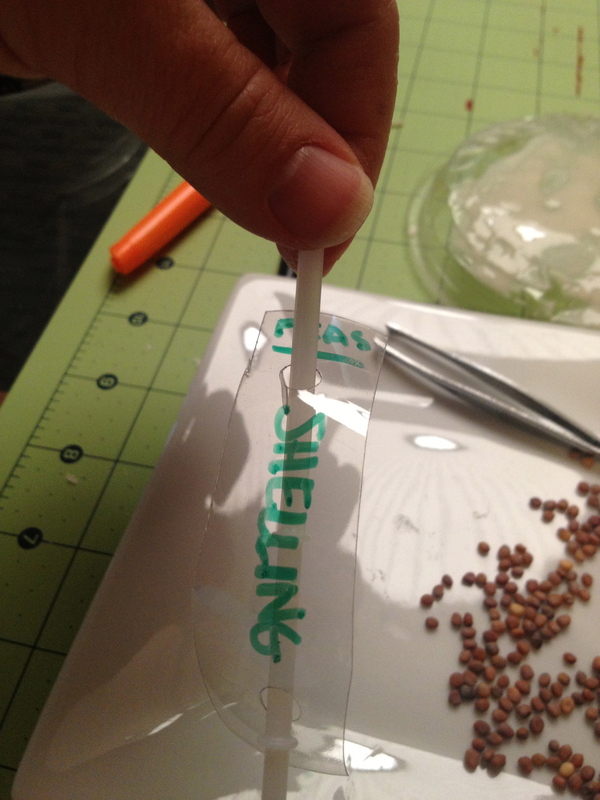 I started out this morning by making radish seed tape. Bigger seeds, faster making time.Remind me next time I bring this great idea up, not to bother. It really didn’t make planting any easier or faster. And I have quite a lot remaining. 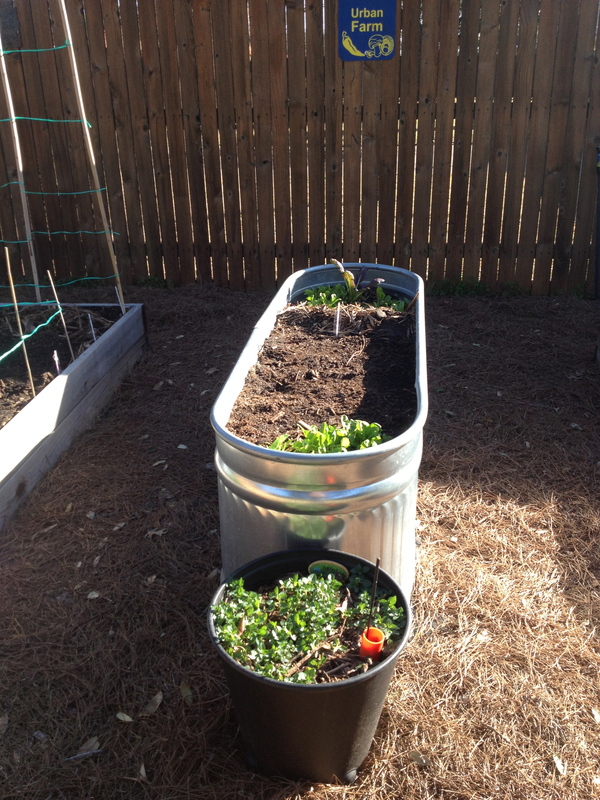 Hopefully I can use it for second and third crops. Or this fall. Or give it away. Sigh. I also upcycled an empty plastic bottle and some plastic skewers from one of those Edible Arrangements into name tags for the plants. I used my trusty Sharpie collection on the plastic. It seemed like a good idea and it shouldn’t get wrecked by the rain so we’ll see how well they hold up in the coming months. After that, it was time to weed the front flower beds. 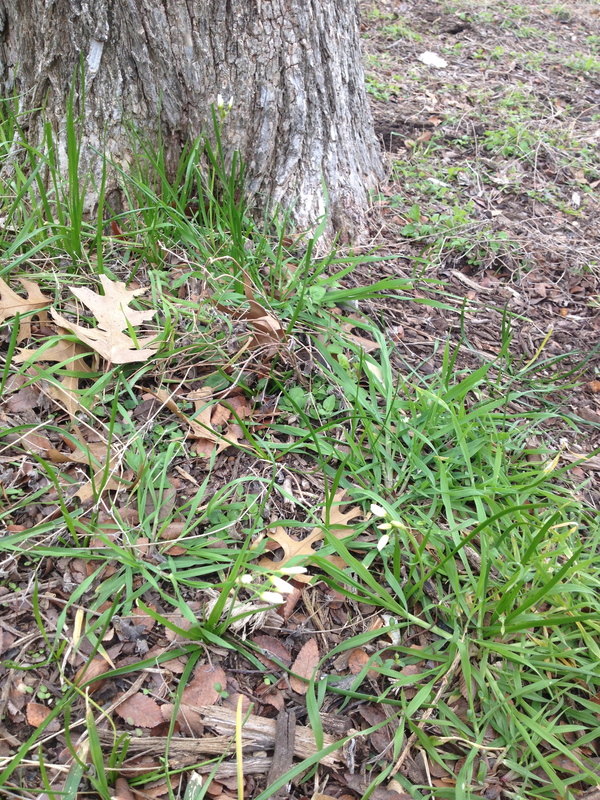 Actually I should say “de-grass” since the type of grass that grows here runs sideways like a centipede. I spent a couple hours pulling out long strips trying to eat the little perrennials and become part of the landscaping. Once all of that was done, the 3G Network and I headed to the backyard to dig in the dirt. I was surprised that I was the only one who actually stayed outside the whole time. Lazy animals wanted to sleep on their comfy beds not the driveway or grass. Lots of winter crop clean up. Harvesting (lots of spinach, collards, kale, mixed lettuce, fennel). Moving herbs to a window box off the kitchen so they survive the heat of spring and summer. 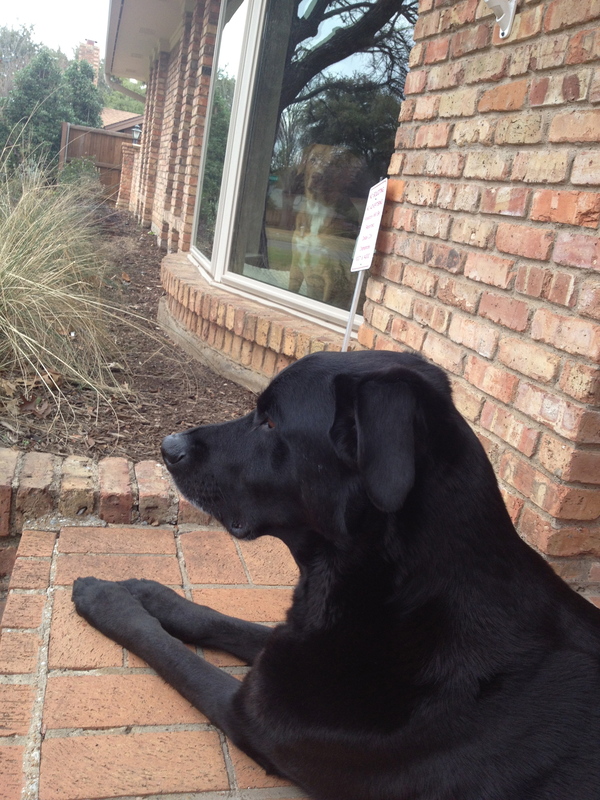 Cleaning up tools, yard waste, dog waste, and just generally puttering around. It was an excellent day. 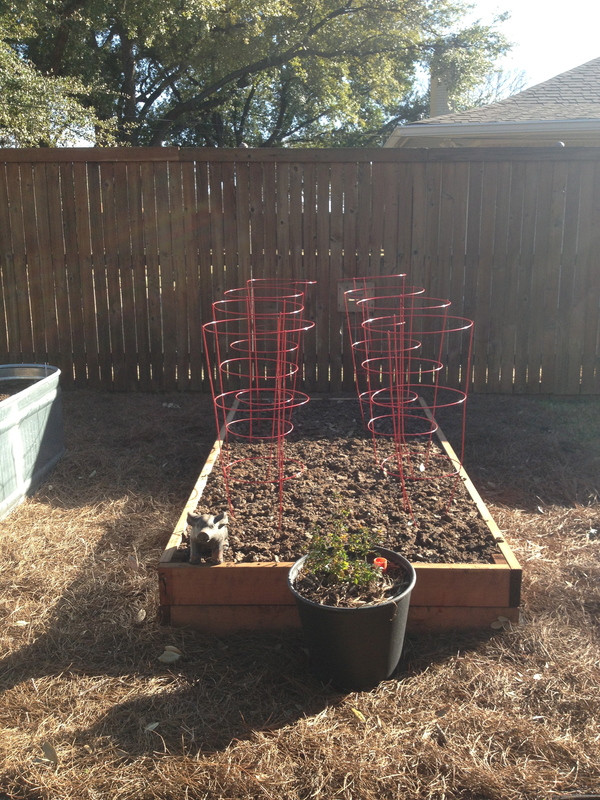 Raised Bed #4: Tomato bed prepped and ready for 8 tomato plants, plus basil once it gets a bit warmer. 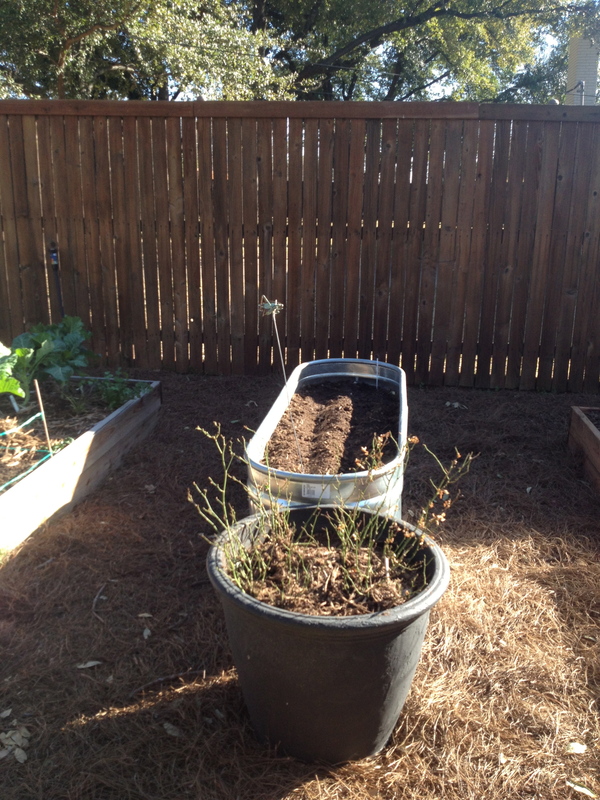 I added the mini rose bush at the end to help with pollination. Stock Tank #3: This is the stock tank where a few of the carrot and radish seed tapes now live. I unfortunately planted it the wrong way. I planted long rows and should have planted width rows for a larger yield. I may dig up what I planted today tomorrow before work and start over. Stock Tank #1: has a drainage issue so it’s drying out for now before I add anything else to it. 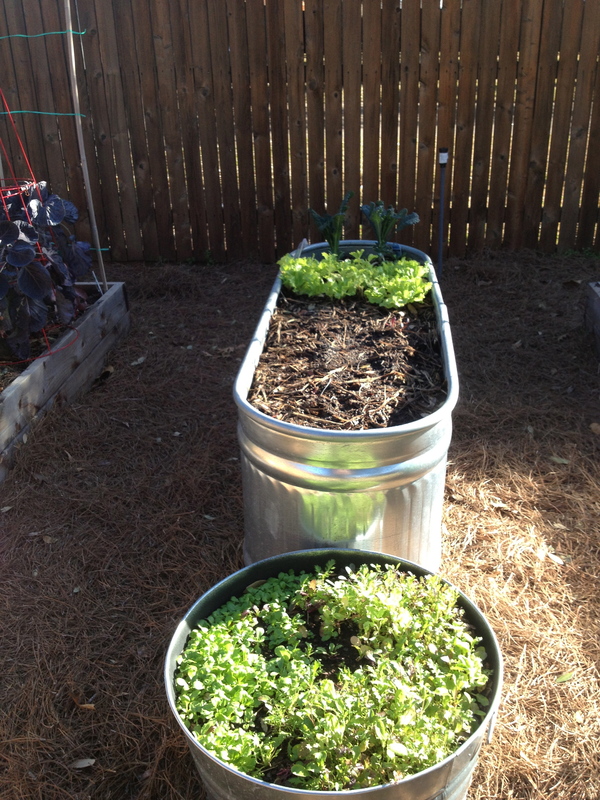 I moved the washtub full of greens in front of it for now and you’ll see there’s some bright green leaf lettuce, a fancy kale and some spinach at the front and back. 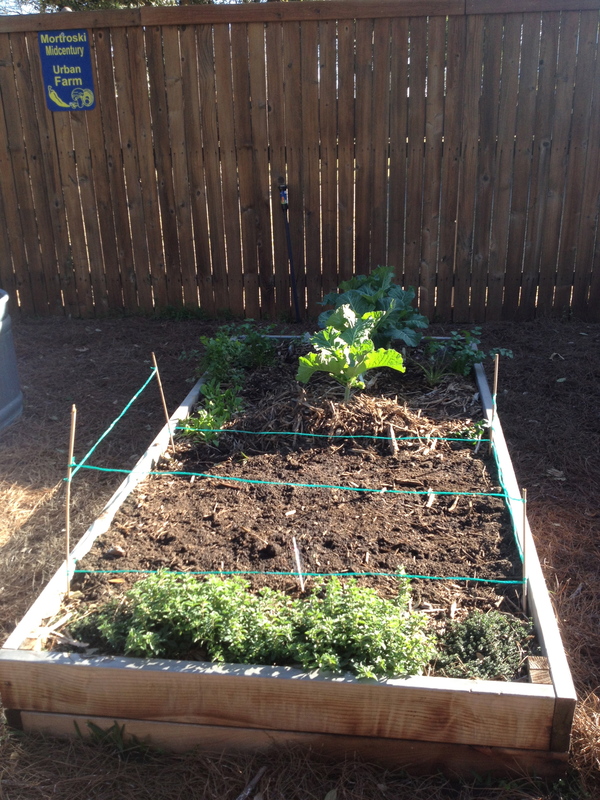 Raised Bed #1: the one that started this whole thing — beets where the George fence is, kale still going strong, chard, brussels sprouts (I’m hoping to harvest very soon), English peas at the back. Whew! Truly a great day in the sun. I wished I had time for a nap once I got everything done, but I didn’t. No rest for the wicked I suppose. It’s almost guaranteed I’ll sleep through the night tonight. I just hope I can move at work tomorrow! 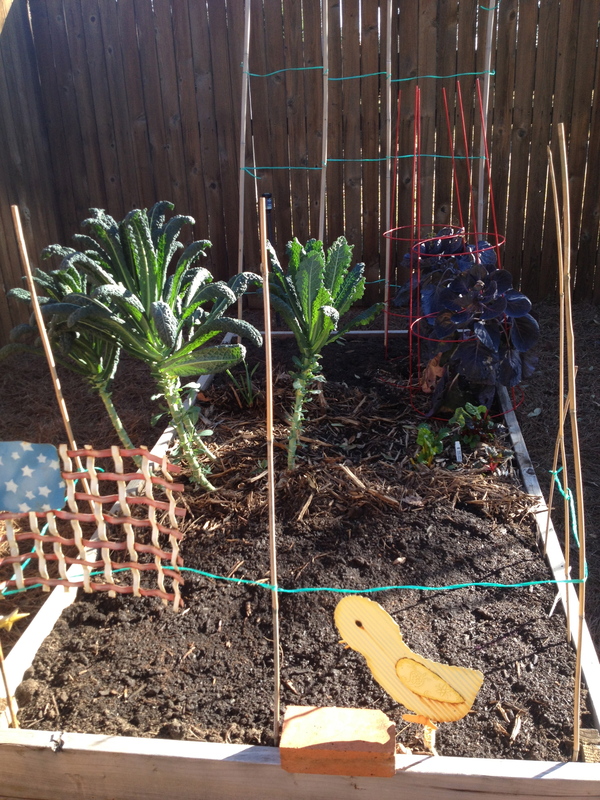 This entry was posted in Sow and tagged 3G Network, beets, dogs, fruit trees, garden, gardening, George, Godiva, Guinness, harvest, Julie Petroski, Kale, lettuce, Mortroski Midcentury Urban Farm, raised bed, sow, stock tank, tomatoes, urban farm. Bookmark the permalink. Great work, Julie. I’m sure you’ll have photographic evidence of today’s success in no time at all. Time for a hot bath.